“Come Listen to the Quiet” The Wild Duck Adult RV Park and Campground is a 70 site adult only park for couples. We offer fine adult camping for honeymooners to retirees. Located in the middle of Maine Audubon’s Scarborough Marsh. Campers enjoy a broad array of wildlife including waterfowls, egrets, herons, ibises, raptors, muskrat, mink, otter, and deer. The Scarborough Marsh is the states’ largest salt water marsh and can be explored by foot or canoe. You can bring your own canoe or kayak or rent one of ours. Enjoy a quiet walk on our clean paved roads or take a short drive to the beaches and downtown Portland. Big Rig Friendly, Paved Roads, All Full Hook Ups, 50/30 Amp Sites, Wifi Internet, Cable TV, Level Sites, Pull Thrus, No Low Branches, Security Gate, Limited Seasonal Sites, Limited Tent Sites, Pet friendly Restrictions, No Night Check – In, Reservations Suggested. 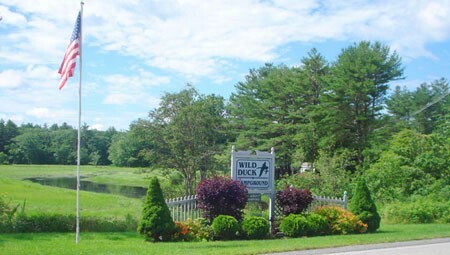 Directions and a map to Wild Duck Adult RV Park can be found on our Web Site.